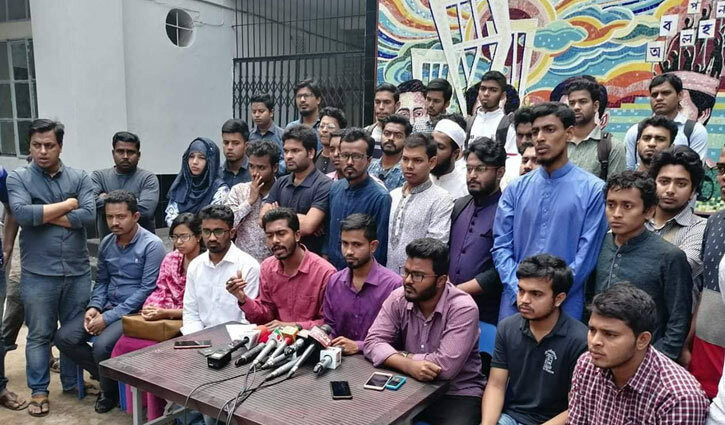 A students body, which led the quota reform movement, declared its panel for the Dhaka University Central Students' Union (Ducsu) election on Monday. Hasan Al Mamun, the organisation's convener, said Nurul Haque Nur, Md Rashed Khan and Faruk Hossain would contest for the posts of vice-president (VP), general secretary (GS) and assistant general secretary (AGS) respectively, reports UNB. All three are joint conveners of the student organisation, which nominated candidates for 17 out of 25 posts. Ducsu election is scheduled for March 11. On Monday, the High Court rejected a writ petition by a Jatiyatabadi Chhatra Dal leader seeking stay on the polls schedule. Progressive Students' Alliance and Anti-imperialism Students' Unity jointly picked Chhatra Union General Secretary Liton Nandi for VP. They chose Chhatra Federation's Umme Habiba Benzeer for GS and Samajtantrik Chhatra Front's DU unit Vice-President Sadekul Islam Sadik for AGS. Meanwhile, a renegade group of Bangladesh Chhatra League also announced a full panel on the same day.